What do you think of this Makeup Brush Cleaning Mat? 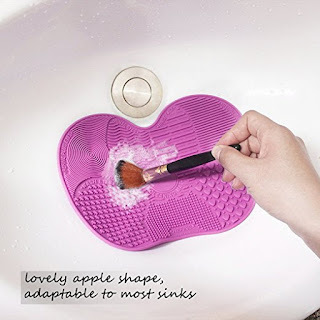 Silicone Makeup Brush Cleaning Mat. Perfect for everyone who wears makeup. Clean your makeup brushes (even paint brushes!) easily and conveniently. Imported environmental-friendly silica gel, non-toxic and odorless, care your tender skin. Suitable for a thorough cleaning of various facial and eye makeup brushes, as well as blackening brush. Strong absorption, easy to use, free your hands. At home or traveling, a brush or several brushes, suitable for different occasions. Lovely apple shape, adaptable to most sinks, fold to store.